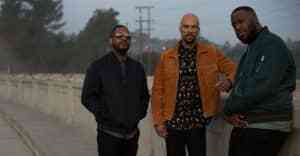 A powerful performance of the title track from Common’s latest. Common took the stage at The Tonight Show last night to perform "Black America Again," the title track from his politically-charged 11th studio album. Com was joined by house band The Roots and BJ the Chicago Kid, who took over vocals on the hook in place of Stevie Wonder. The live version here pares down the original, with light congas in place of a breakbeat, and a small string section still in place. The focus, naturally, is on Com's words. From the opening bars—Here we go again, Trayvon will never get to be an older man—the effect is pretty undeniable. Black America Again drops November 4.